Gen. Frank William Milburn was born in Jasper, Indiana in 1892. Milburn attended the United States Military Academy, and after his graduation in 1914 went into the army as a lieutenant. Milburn served in both World War I and II, but didn’t see battle during World War I because he was stationed in the Panama Canal Zone. Furthermore, Milburn served in many different infantry assignments including, the 5th, 33rd, 15th, and 28th Infantry Regiments. He later graduated from the Command and General Staff School, which enabled him, in 1942 to be promoted to Brigadier General and be selected to command the U.S. 83rd Infantry Division. The 83rd Infantry Division was nicknamed the thunderbolt division, and saw battle on the beaches of Normandy in June of 1944. 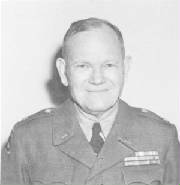 However, Milburn’s command of the 83rd Infantry Division ended in December of 1943, when he took over the XXI Corps. The XXI Corps played a decisive role in The Battle of The Colmar Pocket. The goal of this offensive attack by the Allied forces was to collapse the German Presence in the southern Alsace west of the Rhine to a bridgehead centered on the town of Colmar. The XXI Corps were called in as reinforcements, and were given the difficult task of overtaking the city of Colmar and driving on the bridge at Breisach. General Milburn showed his true leadership when he took over the command of the U.S. 75th Infantry Division, U.S. 12th Armored Division, the French 5th Armored Divison, 1st Parachute Regiment, and 1st Choc (commando) Batallion and led them on to victory by capturing the City of Colmar. After the ending of the War, Milburn shortly served as the commander of the Seventh Army and the XXIII Corps. Finally, at the peak of his career he in 1949 he was promoted to Lieutenant General and served as the deputy commander of the U.S. Army Europe until 1950. Overall, Milburn had an extraordinary career, he commanded five different army corps, was awarded the silver star three times for front-line bravery, and was twice awarded the Army Distinguished Service Medal for his exceptional meritorious service during his time in the military. Thank you for your bio of General Frank Milburn. Just one correction----he was in the athletic dept of Montana State University (now called the University of Montana) in Missoula, not Bozeman. Back then, the institution in Bozeman was name Montana State College. My grandfather, (Major) Harry Adams, was his aid during WWII, and also was his colleague is Missoula as head track coach and asst. football coach.